​Once opened click a second time to magnify. 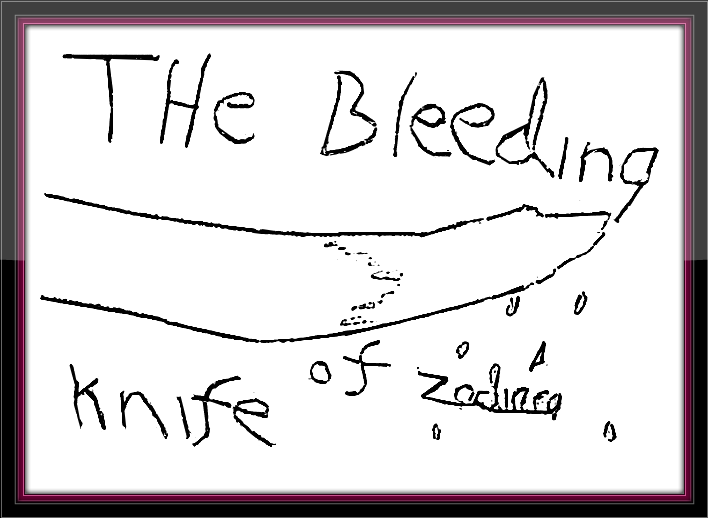 The 'Fairfield' letter was mailed to the San Francisco Examiner on December 16th 1969, just four days before the Melvin Belli letter, with a small fragment of code and a picture entitled 'The Bleeding Knife of Zodiac'. The opening gambit of the letter uses the line "this state is in trouble..I will go for the Goverment life", suggesting more of a connection with the Unabomber, Theodore Kaczynski, who frequented the Sacramento region regularly. 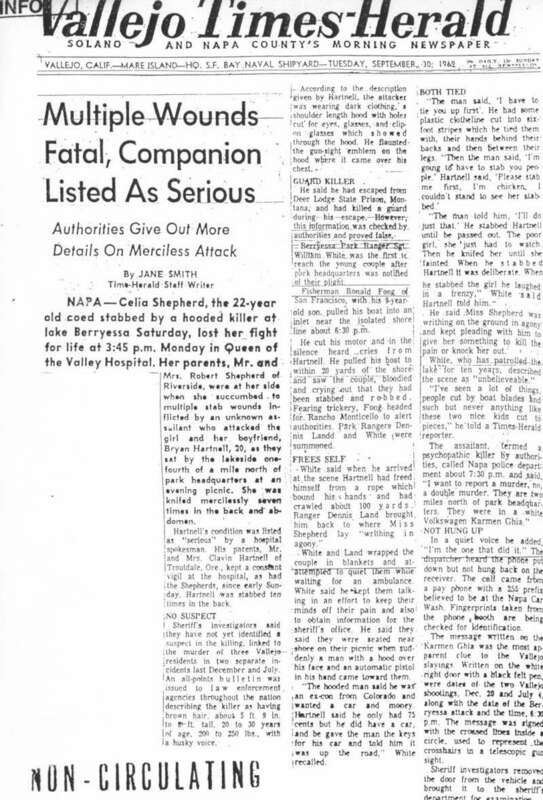 Sacramento was central to the murders of Judith Hakari on March 7th 1970 and Nancy Bennallack on October 25th 1970, and the Fairfield letter threatened nine killings in Sacramento. Judith Hakari had been working at the Sutter Hospital in Sacramento on March 7th 1970, and had later pulled into the parking lot of the Markston Apartments from where she was likely abducted. One and a half months later her body was discovered in a shallow grave - she had been beaten and strangled, but not sexually assaulted. A letter mailed in 1986 claiming to be from the Zodiac Killer detailed a further crime in Sacramento, extremely close to the murders of these two young women. The letter seemingly described the murders of Koy Ien Saechao (48) and Choy Fow Salee (40), as they rested in their parked car by a Sacramento freeway. See here. ​​It cannot be known for certain, but the Fairfield Letter seems to be suggesting a link to the Lake Berryessa attack on September 27th 1969, the only crime committed thus far with a knife. It was always questioned why the Zodiac failed to brag about his theatrical crime on the shoreline of Lake Berryessa, after all, it was his most daring to date. There is no definitive answer, but one thing the Zodiac Killer never foresaw, was that he was to leave a surviving witness, in Bryan Hartnell. He could have bragged endlessly about this crime, but in hindsight his failure to kill both victims actually played right into his hands. The detailed account of Bryan Hartnell, the description of the killer's costume and the extensive newspaper accounts gave him all the publicity he could ever have wished for. What more was there to add. However, newspaper accounts were starved of the full details, in that the 'by knife' writing on the car door of Bryan Hartnell's car was withheld, probably to flush out the real killer from any subsequent hoaxers, and the December Fairfield Letter may be one such example. ​Anybody who was aware of the Lake Berryessa attack could have concocted the phrase "The Bleeding Knife of Zodiac", and more importantly, its failure to highlight "by knife" was an opportunity missed from a killer, who from October onward seemed determined to link himself to the authenticity of his communications by enclosing several swatches of Paul Stine's shirt. The Zodiac Killer had his ego dented when his first cipher was cracked in a matter of days by schoolteacher Donald Gene Harden and his wife, Bettye June Harden, two amateur sleuths. His response was to send us the still unsolved 340 Cipher, crafted either with no solution, or a solution that went far beyond simple homophonic substitution. 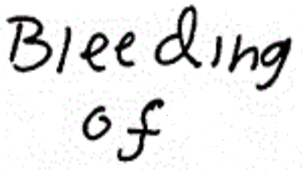 The Fairfield Letter, however, appeared a retrograde step into mediocrity, when the supposed Zodiac Killer offered no more than nine 'scribbled' symbols, showing little effort, in the apparent guise of a small code, and beginning his letter with "I just want to tell you this state is in trouble, I will go for the government life". This has overtones more reminiscent of a political agenda or threats toward the police, and was accompanied by the extremely bold claims of a potential 38 victims. ​The "knife" wording does look similar to the writing on the car door at Lake Berryessa, but the template for these letters was freely available throughout his correspondence up to this point. He also fails to corroborate this letter with a swatch of Paul Stine's shirt- why?- possibly because the real Zodiac Killer was to mail correspondence to the residence of Melvin Belli just four days later. 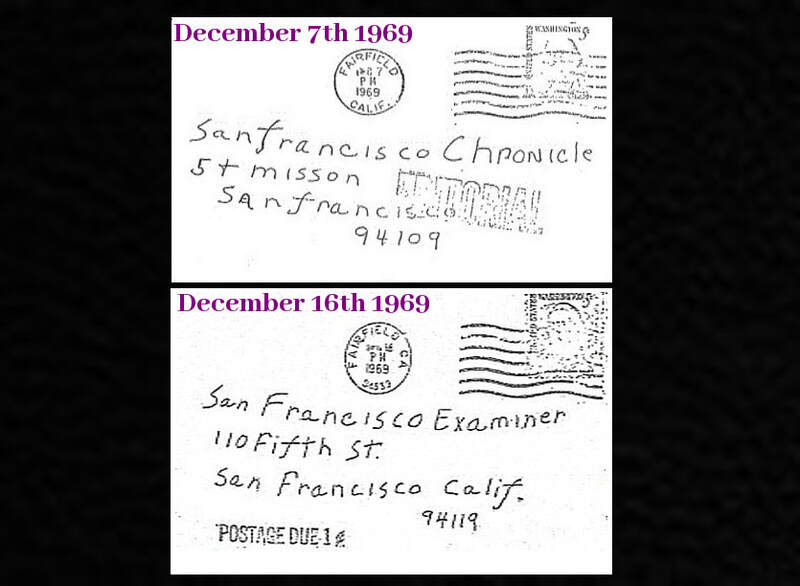 The Fairfield Letter was mailed on December 16th 1969, sandwiched between the Bus Bomb letter of November 9th 1969 and the Melvin Belli letter on December 20th 1969, and it was this reason, along with its design that has placed this relatively early letter into the section of unlikely Zodiac correspondence. The main reason for this, centers on the belief that the Zodiac Killer after murdering Paul Stine in Presidio Heights on October 11th 1969, actually mailed three pieces of Paul Stine's shirt to the newspapers, not two, as is widely believed by many people. 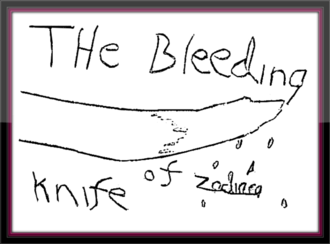 This is not a new concept, as there is a thorough section devoted to this on the excellent ZodiacKillerSite forum here. For those who have not come across this forum, we shall do a brief summary, before bringing the Fairfield Letter into the equation. It is widely acknowledged that two pieces of Paul Stine's shirt were mailed, firstly, to the San Francisco Chronicle on October 13th 1969, just two days after his murder, and secondly, on December 20th 1969 to the home residence of prominent attorney Melvin Belli. However, a third piece was mailed in tandem with the 'Bus Bomb' letter on November 9th 1969, outlined in the FBI files, two articles written by the San Francisco Chronicle and also a Youtube documentary. The mailing of three portions of Paul Stine's shirt is evident from photographs of the shirt published on the Zodiac Killer Facts website marked A, B and C.
Had the Zodiac Killer set aside three portions of shirt to send, it is highly unlikely he would want to be sitting on incriminating evidence for too long, and after the murder of Paul Stine in Presidio Heights on October 11th 1969 he would mail his three portions of shirt with his next three correspondences. His first being the October 13th letter, just two days after the murder, his next letters (November 8th and 9th) were postmarked within one day of each other, so he sent the second portion with these, and the final piece was mailed with the Melvin Belli Letter on December 20th 1969. What he didn't do, however, was mail a piece of shirt with the Fairfield Letter on December 16th, four days before the Melvin Belli Letter. This may suggest it was not mailed by the Zodiac Killer, although this is far from conclusive in dismissing this correspondence altogether.